The couple’s mindset was aligned to sustainability in its rawest form, with a ‘if it ain’t broke, don’t fix it’ philosophy. With this in mind, they were determined to focus their attention towards enhancing existing areas and creating new areas (add-ons) to the home to establish spaces they wanted but had never had. There were four add-ons that were introduced to this project. The most basic of the four was a double carport that was deliberately designed with the same style and theme as the original home so it didn’t look like an add-on. The second add-on was a pod-like addition that “plugged into” the side of the existing master bedroom. This houses the master ensuite and walk-in-robe that were lacking from the original 3x1 home. The pod-style nature of this addition clearly distinguished it from the original home. The third add-on was the largest and most involved of the additions. 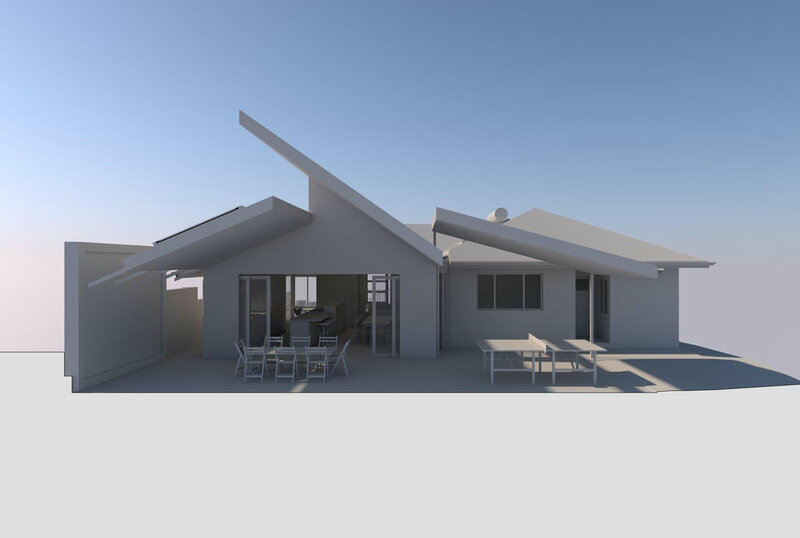 Here a double skillion pavilion space encloses the new dining, new kitchen and new sun room of the home. Hints of the skillions provide a subtle yet distinguished addition to the existing home when viewed from the street. The original kitchen of the home was converted into a home office which looks into this pavilion through the kitchen window that once looked outside. Natural light from the pavilion highlight windows penetrate deep into the home office through the original kitchen window to create an interesting and clever way for borrowed light to naturally illuminate the middle of the house. The last of the add-ons comes in the form of a steel framed outdoor shelter which features a series of skillions to create ties to its pavilion companion, whilst allowing light to filter through the open-air skylights of the shelter skillions. 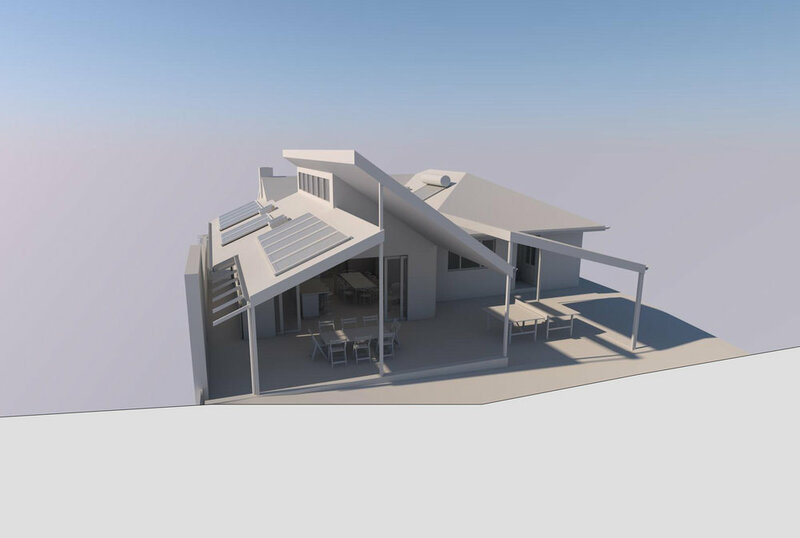 The client’s appreciation and interest in sustainable design allowed us to showcase how the science of architecture can be applied through clever design to influence (in varying degrees) both the new and existing spaces of the home. 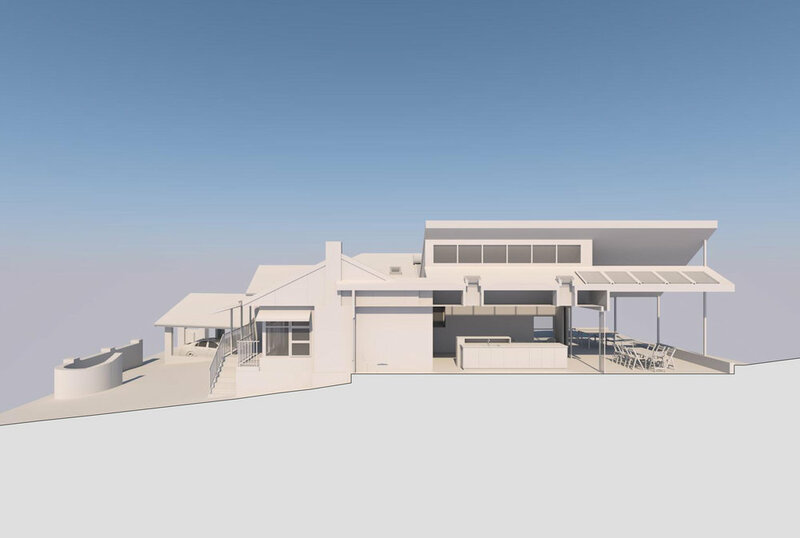 The client’s expertise and trade background in electrical and solar voltaic installations, allowed him to specify the exact angle required for the north facing pavilion skillion in order to efficiently harness the sun’s rays that are cast on each of the solar voltaic panels. Major renovations that are designed to be constructed in one hit can be disruptive, stressful and expensive. 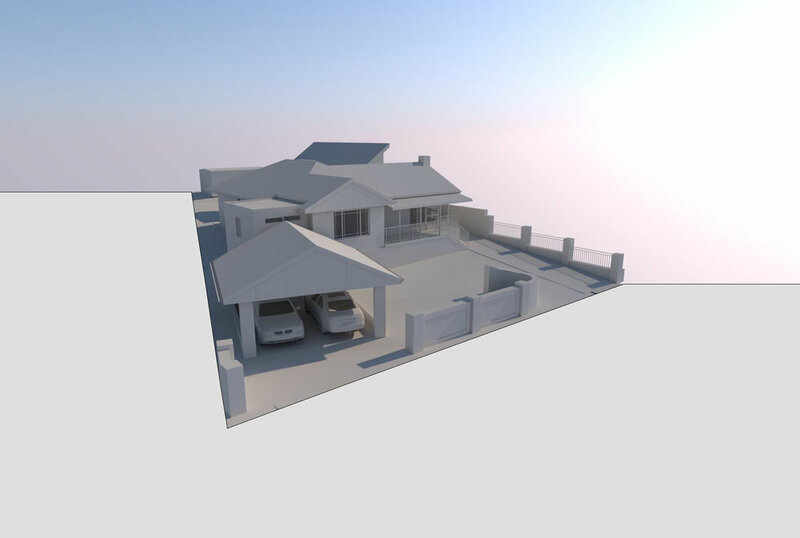 This project demonstrates that with the right planning, interpretation and understanding of a client’s vision and budget, renovations can be staged to be completed over time. This staged process allows the client to budget for each stage so they can gradually improve and make upgrades to their home and ultimately achieve their dream.